Arturo Vargas of the National Association of Latino Elected and Appointed Officials talks about the importance of the 2020 census as a power outage turned out the lights in the meeting hall at the Resurrection Catholic Church on Tuesday, February 20, 2018 in Alamo. ALAMO — A potential loss of millions of dollars in federal funds over a decade. This is what is at stake for the Rio Grande Valley during the 2020 Census, according to Christina Patiño Houle, spokeswoman for the Rio Grande Valley Equal Voice Network. Patiño Houle said for every household not counted during the census, the region loses $100,000 per year over a 10-year census cycle. That money goes to the funding of government programs for federal highways, early childhood education and children’s health insurance, to name a few, according to data provided by the National Association of Latino Elected and Appointed Officials Educational Fund, or NALEO. 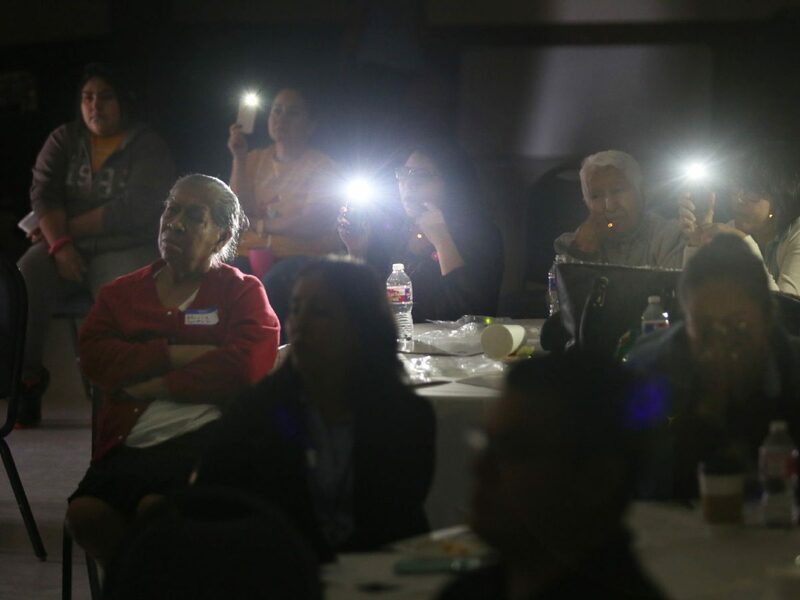 Veronica Casados, center, holds up a light on her cellphone that illuminates Maria Gomez, left, as they listen to a presentation on the 2020 census after a power outage turned out the lights in the meeting hall at the Resurrection Catholic Church on Tuesday, Feb. 20, 2018, in Alamo. Preparation for the census has begun and people at the meeting voiced concern on how the census will be administered and if citizenship questions will be on it. But in a concerted effort to avoid the huge loss of resources, members of the RGVEVN — including local groups ARISE, La Union del Pueblo Entero, Fuerza, and Proyecto Juan Diego — met and heard this week from representatives with NALEO and the U.S. Census Bureau on how to achieve a complete census count in 2020. 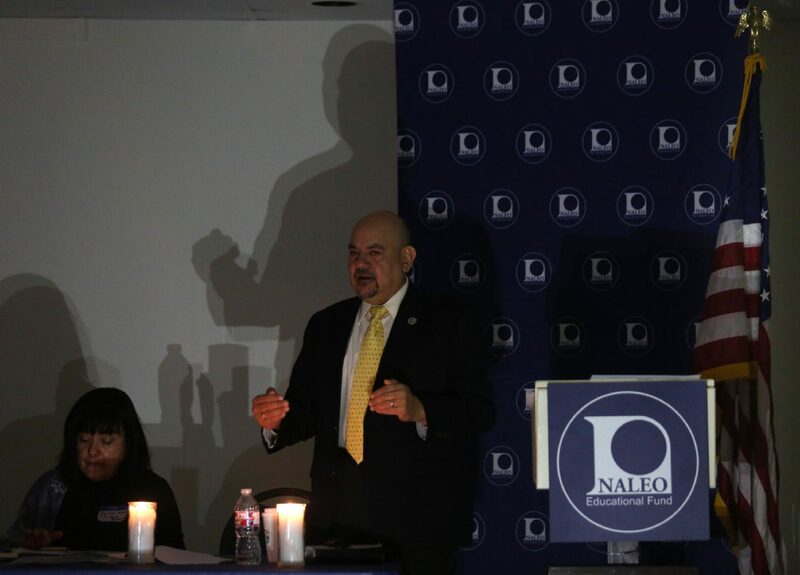 Following a brief news conference, NALEO executive director Arturo Vargas, along with Pauline Nuñez of the bureau gave a nearly two-hour presentation inside Resurrection Catholic Church to RGVEVN members, congressional office aides, representatives of the Hidalgo County judge’s office, and representatives from the University of Texas Rio Grande Valley, to name a few. Citing issues Latinos currently face throughout the country, Vargas said getting a full count of people in the Valley, which is predominantly populated by Hispanics and has a significant amount of undocumented people who reside here, is made more difficult by the current political climate in the country. “We are perhaps in the most anti-Latino, anti-immigrant environment that we have had in this country, and it’s in that environment that we have to encourage our community to participate,” Vargas said. Bringing up the most recent census in 2010, Vargas said about 2 percent of all Latinos were not counted then, especially young children and the elderly. Exacerbating problems with the coming census is the lack of resources Congress has provided for the 2020 count. Nuñez, who acknowledged the underfunding issue and has been with the bureau for more than 10 years, said the bureau is currently in the education phase of their efforts. By working with RGVEVN, congressional offices, county and educational representatives, Nuñez believes they can get a full count even with the obstacles they are expected to face this time around. The 2020 Census, which will continue the practice of mailing out questionnaires as its main form of information gathering, will also utilize an online website where people can count themselves. This new proposed method drew concerns from RGVEVN members, who believe it will be problematic in colonias and other low-income areas where internet access is sparse. Ramona Casas, of the non-profit ARISE organization, said internet access for people in the Valley isn’t widely available or reliable. “They want to use the internet to count people, but many families — low income families in the Rio Grande Valley — don’t have access to the internet,” Casas said. Another issue that may come up and of most importance to RGVEVN members in attendance, was the idea that the final census questionnaire could include a citizenship question. In early December 2017, the Department of Justice requested the bureau to include citizenship in the questionnaire, according to a letter dated Dec. 12, 2017. In response to the DOJ request, 19 attorneys general signed a letter urging the Department of Commerce to reject the citizenship question. “Adding a citizenship question — especially at such a late date in the 2020 Census planning process — would significantly depress participation, causing a population undercount that would disproportionately harm states and cities with large immigrant communities,” the letter reads in part. The bureau has until April 1 of this year to notify Congress of the questions that will be on the 2020 questionnaire. Juanita Valdez-Cox, executive director of LUPE, said convincing a vulnerable population to answer citizenship-related questions would severely hamper efforts to get a complete count. Patiño Houle said this is where RGVEVN and its partners can take the lead. Vargas said the DOJ’s request will scare people away from completing the census and compromise the process. “It’s in the constitution that every person be counted, and anything this Congress would do to scare people away from being counted would undermine their own constitutional responsibility,” Vargas added. “So we are the ones here to call upon Congress: Do your job; make sure you count everybody; you don’t need to count people and ask them for their citizenship. It’s not a requirement in order for the purposes of the census.